Experience Australia on horseback as you trek through the unsurpassed beauty of Kosciuszko National Park proudly located in the Snowy Mountains that inspired Banjo Patterson's, "The Man From Snowy River". Here is your chance to navigate the land renowned for its rugged mountain horsemen, wild brumbies and breathtaking Alpine wilderness. Unchanged by time and bestowed with a wealth of nature’s treasures, the park’s hidden caves and valleys are yours to discover with the help of our outfitters in nearby Adaminaby. From the lush mountain tops, survey the valley below carpeted in wildflowers and marked by streams and natural watering holes. Ride over plains where the wild bush horses roam, then explore limestone caves and historic high country huts before refreshing with a dip in secluded mountain streams accessible only by horseback. You will be taken to prime trout fishing locations and encounter gold mines of the past where fortunes have been won and lost throughout history. Later, sitting pleasantly fatigued around the campfire you will share laughter and stories of the day's ride with your co-travelers. A warm and hearty three-course meal is cooked for you, accompanied by freshly-made damper washed down with mugs of billy tea. Sit back and enjoy the relaxation and sense of physical well-being from a great day's ride in the magnificent Australian high country. When the campfire goes out, sleep under the stars or in tents as you recharge over night for what the next day holds. We trek throughout the northern part of the park, including landmarks such as Cave Creek, Curraingo Plain, Tantangara Creek and Mount Tantangara. A seven day expedition covers an approximate distance of 160 kilometers, although shorter treks are available upon request. At day end, 4x4 vehicles meet you with all the gear required for your overnight stays. A pick up from Cooma is available. Flights to Cooma are not always available. You may have to fly into Canberra and take the bus to Cooma. There are also bus schedules from Sydney all the way to Cooma. Arrive in Cooma by about 7 PM. Check out is at 10 AM on SA. Rates do not include: Sleeping bag and oilskin rentals are available at AUD$45 each. Bring your own wine etc. Transfer from Cooma. Please arrive between 5pm and 7pm, allowing time to meet fellow adventurers. Each adventure begins with an introductory dinner hosted by John and Roslyn, your hosts. Bring a bottle of wine for the first and last nights if you so desire. After dinner you will be briefed on the week ahead. All rides explore the breathtaking scenery of the Kosciuzsko National Park. You will be taken to streams where trout fishing is at its best, visit historic goldmines, limestone caves and high country huts. We ride through the northern part of the Park with places such as Cave Creek, Currango Plain, Tantangara Creek, Mount Tantangara (well known for the wild brumbies that frequent the area) and Mount Morgan. Last night is back at the lodge for a hot shower, farewell dinner and overnight in a cozy bed. The above sample itinerary is subject to changes at the tour operator's discretion. Thoroughbreds, Arabs and Australian Stock Horses. Australian Stock Saddles and English if required. This ride caters to all level of rider, from beginner to experienced riders. Those who have done very little or no riding find that they are soon confident on horseback, largely due to the expertise and encouragement of your guides. Experienced riders find that their skills are refined by the end of the week, also under the leaders' watchful eyes. Our safaris cover up to 160km on a 5-day safari, averaging 5-6 hours per day. A degree of physical fitness and good health is necessary for you joining the treks. Maximum number of riders is usually 16. All guides are AHRC Certified with years of experience and all possess First Aid/CPR training. In the event of an injury, we will arrange evacuation, first aid, and medical assistance, at your expense. -Will I see brumbies whilst on safari? Whilst we do not guarantee that you will come across brumbies whilst on safari, most guests have the privilege of brumby encounters. -Do I need to wear a helmet when I go riding? Unless you are under 18, you will not be required to wear a helmet. You will be asked to sign a waiver if not wearing a helmet. -Can I bring my own horse? No, unfortunately we do not allow you to bring your own horse as the brumbies may try to run off with your horse. -Can I bring my own saddle? Yes, it is fine if you would like to bring your own stock saddle, we do not allow western style saddles. Alpine weather can change dramatically, so we ask that you be prepared for all conditions. The summer months (we only offer our rides during the summer) enjoy a mild temperature in the alpine regions, with highs of around 22C, although the weather can still be unpredictable and snow sometimes falls even in summer, so take some warm clothing. In the lower altitudes the temperatures may climb into the 30s Celsius! Alpine weather can change dramatically, so we ask that you be prepared for cold, wet and windy conditions. Riding helmets and pillows can be borrowed. Let us know at the time of booking. Oilskins and sleeping bag to rent at $45.00 each. First and last night will be at the lodge and the other nights will be camping at one base camp. There is no WIFI at the homestead or while camping, allowing you to disconnect an immerse yourself in nature. Laundry is available at the homestead at no additional cost. Accommodation is lodge style, 20 rooms, with each room accommodating 2 to 6 people with shared bathroom facilities. Rooms are heated with all linen, bedding, and electric blankets provided. A separate games and TV room is available. At the end of each day our four-wheel drive vehicles will meet you with all the gear for the overnight stay. Tents are large 2-4 person tents. We supply all-weather tents, comfortable mattresses, and extra blankets for warmth, however, you are welcome to bring your own gear- just let us know in advance. It is a good idea to bring your own pillow for camping, but we do supply pillows for camping upon request. There are toilets at most campgrounds. Bush showers are available on-site. Most safaris provide the opportunity to refresh / swim in mountains streams and Lake Tantangarra. (No pollution to these areas with soaps etc.). There will be a campfire to socialize around at night. While you would normally bring your own clothing, wet weather gear, riding boots, and sleeping bag, we can optionally supply you (at extra cost) with sleeping bags and oilskin coats. 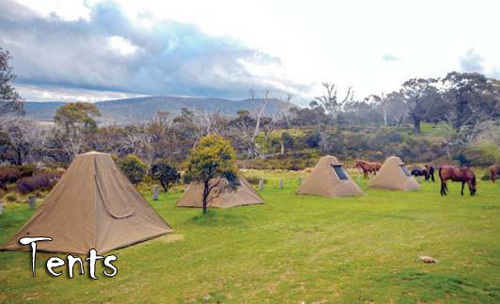 Single rooms and single tents are available on request, dependent on availability. Please let us know your preference at the time of booking. All meals are included from dinner on Day 1 to breakfast on your last day. 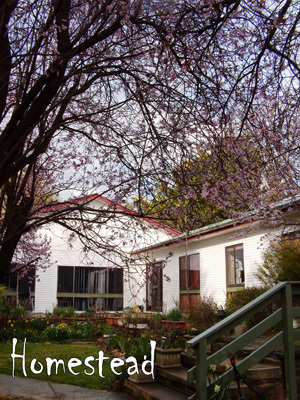 Mealtimes are happy, communal events served in the homestead straight from Roslyn's kitchen. Homemade soups and colonial roast lamb are their specialties, while Snowy Mountain trout provides a mouth-watering appetizer. There will be a campfire to socialize around at night and a hearty three-course meal is cooked for you, with damper and mugs of billy tea. Meals are prepared by our wonderful Irish chef. The lodge is not licensed for liquor sales, but you are free to bring your own wine for dinner.